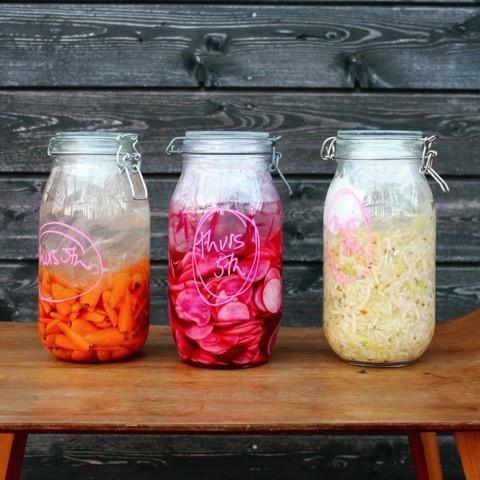 Our resident nutrition guru Naomi is nuts about fermenting and she wants you to join her! Make your own fermented carrot sticks or dilly green beans and a seasonal kraut to take home and mature. Taste a range of fermented vegetable pickles and learn how to include them in your diet. Watch miraculous beet kvass and milk kefir being made and enjoy a milk kefir smoothie. Taste the bubbly delights of water kefir and put hairs on your chest and good bacteria in your gut with pickle brine shots. Please note that you are required to have an entrance ticket for the festival. This class is suitable for gluten free diets but wheat flour is used in the cookery school during the day. We regret there are no member discounts for this class. This masterclass will take place in our cookery school from 1.30-2.30pm. Click the ‘notify me’ button below to receive an email when new dates for this event are released. You can unsubscribe at any time. This class is suitable for all levels (over 12s only please). Under 16's must be accompanied by an adult. We put these guidelines in place for the safety, comfort and enjoyment of all our guests. Suitable for gluten free but please note there will be allergens within the proximity. Please tell us of any allergies when booking.